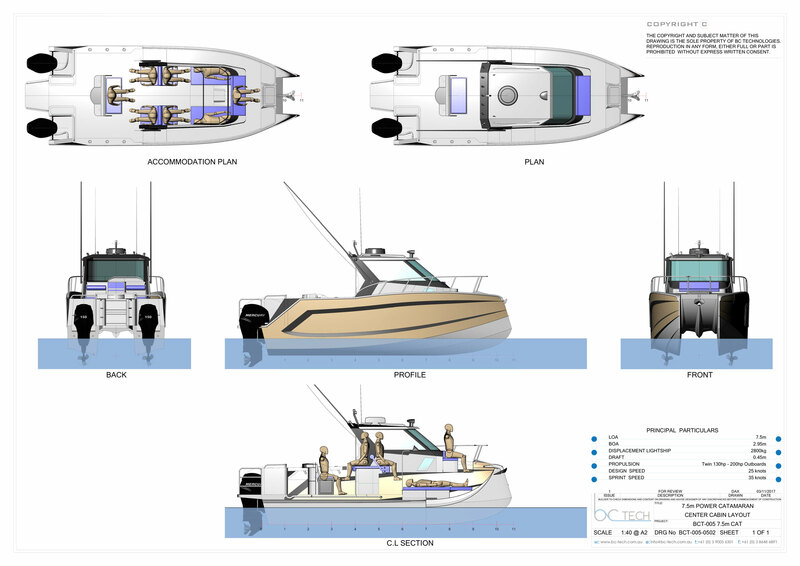 Center cabin has been specifically designed for sportfishing. Features a full stepped cabin walk around with battle stations both forward & aft for landing that trophy fish. There is an enclosed head and twin berth forward of the helm, reversible seating for four aft of the helm & a twin sink work station at the aft end of the cockpit with built in 115lt ice box & live bait tank. The full cabin features a traditional full cabin layout with generous sidedecks for facilitating easy access forward. There is an enclosed head and twin berth forward of the helm, reversible seating for four aft of the helm & a twin sink work station at the aft end of the cockpit with built in 115lt ice box & live bait tank. A more traditional centre console layout featuring an enclosed head under the helm, full single level walk around & seating both fwd & aft of the helm.